Samsung’s new Galaxy Tablet is the answer to Apple’s iPad, but it’s barely competent–which is precisely how Samsung rolls. A history of merely satisfactory products proves the point. Samsung is one of our Most Innovative Companies for good reason–their microchip and memory business is one of the best in the world, and the company is definitely on the shortlist of most dominant consumer tech companies. They sell the most TVs, are second only to Nokia in worldwide cellphone sales, and fall in the top five in just about every other corner of the industry. Yet Samsung’s consumer products consistently underwhelm. Samsung is safe. They wait to see what works and release their own pretty good, decently performing version at a fair price. But that’s not the stuff of greatness. Here’s what we mean. The Apple iPad was a was a new breed of tablet with a new philosophy: No longer would a tablet be a convertible laptop with a touchscreen. 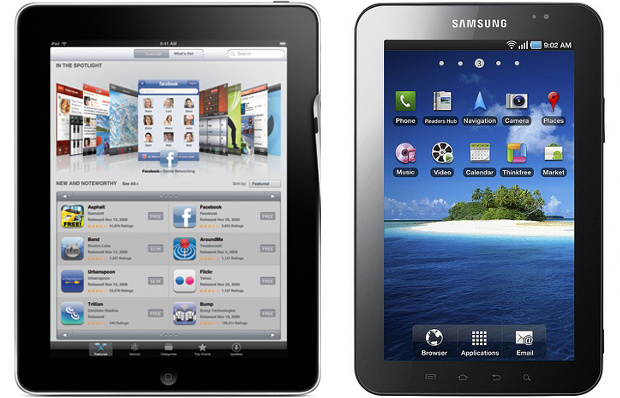 The iPad uses a mobile processor, mobile operating system, mobile wireless card, and forgoes a physical keyboard. Samsung’s takeoff is a smaller device (7-inch screen, compared to 9.7-inch), but also packs a mobile processor, mobile OS, mobile wireless card, and a thick-bordered capacitive touchscreen. Both devices offer stiff competition to ebook readers as well, with Apple launching iBooks and Samsung embracing Borders’s Kobo software. 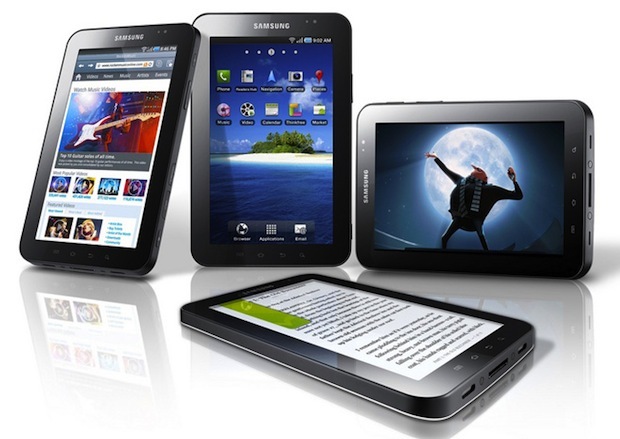 Is the Galaxy Tab an iPad competitor? Sure. It looks pretty good, and might even be better for reading than the iPad (mostly due to size and weight reductions). But nothing in particular sets it apart–it’s not breaking new ground, it’s merely what you thought it’d be. It’s quintessentially Samsung: a B+. Samsung’s Epic 4G, one of its “Galaxy S” Android smartphones (a different Galaxy S phone is headed to Verizon, AT&T, T-Mobile, and Sprint–the Epic 4G is Sprint’s), is probably the best smartphone available for Sprint right now. But it’s still an example of Samsung’s “good enough” mentality. HTC’s Evo 4G garnered tons of buzz and huge sales, despite the major handicap of subpar battery life that was mentioned ad nauseum in every review. The Evo 4G was the start of a new breed of phone: With a huge 4.3-inch touchscreen, advanced media capabilities, a great custom version of Android, and top-of-the-line guts (including Qualcomm’s Snapdragon processor), the Evo 4G was bound to be a big seller. But it was also the very first 4G phone in America, taking advantage of speeds closer to broadband speeds at home than to the usual 3G. Samsung’s Epic 4G, which followed a few months later, was the second 4G phone in America. It too had top-of-the-line internals and a custom Android OS, and has also sold quite well. Its superior battery life and hardware keyboard make it arguably a better phone than the Evo 4G. But it’s not a Big Deal. The Evo 4G was a Big Deal. The Epic 4G doesn’t go out on a limb, and doesn’t inspire excitement. When we talk about the phones that have made Android the success it is today, we talk about the T-Mobile G1, the Motorola Droid, the HTC Droid Incredible, and the HTC Evo 4G–the phones that took Android a step further into the future. The Epic 4G will never be in that pantheon. It’s a very well-made phone, but that’s all it is. The Canon S90 is a marvel of engineering, an endlessly surprising little wonder. It’s Canon’s line in the sand: This, says Canon, is the best point-and-shoot camera in the world, and we don’t have to prove it with meaningless stats. success. Canon took a risk and pulled it off. It abandoned the fruitless megapixel war–photogs and Canon know a 14MP camera is absolutely not guaranteed to take better photos than an 8MP camera. But the general public doesn’t. Enter Samsung. A few months after the S90, Samsung announcing the TL500. It too is an expensive ($450) point-and-shoot offering just 10MP. It’s an extremely well-performing, thoughtfully-styled camera that will blow a 14MP Sony out of the water, with a few extras (like a swiveling AMOLED screen) thrown in for good measure. It’s a very nice product, and it should sell quite well. But it will not be, nor was it ever intended to be, a smash hit, spoken about with awe amongst the tech nerds. The S90 already broke this ground–the TL500 simply follows along. Qualcomm’s Snapdragon, a very low-energy 1GHz processor, is the muscle of choice for modern Android phones like the HTC Droid Incredible, Google Nexus One, Dell Streak, and Sony Xperia X10. It’s also the mandatory minimum power behind Microsoft’s upcoming Windows Phone 7 line. The Snapdragon isn’t the only game in town, of course–Texas Instruments has a competing 1GHz chip found in the Motorola Droid X and Droid 2, and Nvidia’s Tegra, while underused, is often linked to upcoming tablets. But the Snapdragon powered the first 1GHz Android phone, the Google Nexus One, and is the undisputed champion of the Android world. Apple’s iPhone is like the friendliest virus you could imagine, wreaking delightful havoc through Apple’s catalog. Apple’s first tablet? A big iPhone. The newest iPod Nano? A teeny iPhone (sort of). The iPod Touch? A phone-less iPhone. Giving customers the ability to get the groundbreaking iOS interface, along with all those great apps, without the expense or hassle of a monthly phone bill made the iPod Touch a huge success. And with one great success comes a Samsung product in its wake. Samsung’s portable media players were always pretty good–nice design, fairly priced, excellent sound quality–but never particularly innovative. Ditto the P3, Samsung’s pretty-good PMP released in April 2009. With a super-thin brushed metal design, great sound quality, extensive format support, and big touchscreen, it looked like an iPod Touch killer. Except it wasn’t. With no Wi-Fi, the P3 couldn’t download apps (thus restricted to a bunch of mostly-useless widgets that came pre-packaged) and its interface wasn’t as smooth or stylish as Apple’s. The P3 was a totally competent portable media player–certainly more capable than the iPod Nano, say–but its lack of ambition and willingness to be merely good doomed it to the “not an iPod” bin. 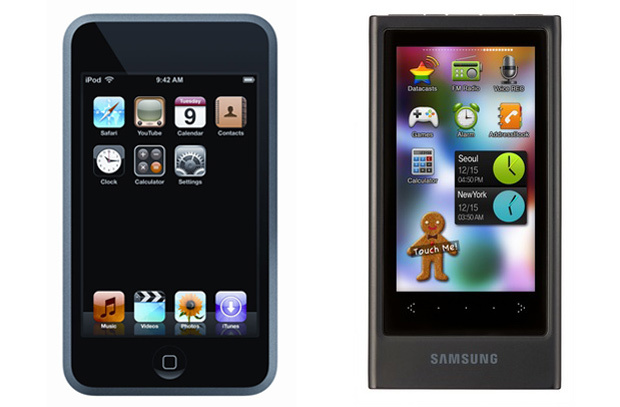 These are just a few examples, meant to show an overarching theme to Samsung’s products. There are a few Samsung releases that don’t follow the mold: Samsung’s TVs are excellent, and the company (for better or for worse) is at the forefront of 3D technology–although to be fair, only minor spec details separate Samsung’s offerings from those of Sony, Panasonic, LG, Vizio, and the rest. On the other hand, the Omnia II, a Windows Mobile smartphone, and the Behold II, an earlier Android smartphone, were both complete disasters. But for the most part, Samsung seems content to sit back, only releasing a product if there’s already been a similar one that’s seen significant success. The company is generally reliable, releasing reasonably styled, reasonably priced, reasonably functional products. But in a world where companies like Apple, Google, Microsoft, HTC, and even Amazon are willing to step up and release groundbreaking products they believe in even though they may not succeed, Samsung’s reluctance to wow us just doesn’t cut it.